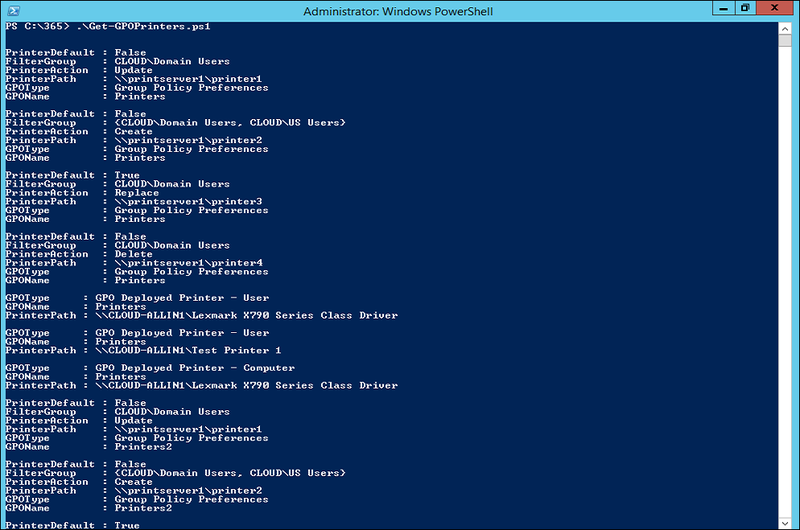 In addition to my earlier creations that gives you an inventory of your GPO Deployed Printers and GPP Drive Maps, I’ve now created a similiar script that makes inventory of WSUS settings in all your GPO’s. This can very much come in handy when having an extensive amount of GPO’s that are controlling WSUS settings (e.g. for different maintenance schedules). Function that find certain information about all your WSUS related GPO's. The script are provided “AS IS” with no guarantees, no warranties, and it confer no rights. throw "Module GroupPolicy not Installed"
When I find the time I’ll create a more complete set of GPO reporting functions with more functionality than they have today, maybe with help from Ramblingcookiemonster that has extended and created additions to the GP Preferences functions. Until next time, Happy GPO Reporting! This entry was posted in Active Directory, Group Policy, PowerShell and tagged Get-GPOWsusInfo, GPO Reporting, PowerShell Report, WSUS GPO, WSUS Group Policy on February 5, 2014 by Johan Dahlbom. This is an issue that have been out for quite a while, but I see it a lot when checking customers environments, so it’s always good to remind yourself about this kind of important things. Through GPP, you have the ability to do lots of stuff, one of them is fiddling with builtin local accounts on computers and even change password on those. A common case is applying GPP settings as below to your client computers. Note the warning about where the password will be stored. It actually gets worse from there… with the script which can be downloaded here, you can extract ALL passwords from ALL GPP’s you have since they are stored in XML files located on the sysvol in your domain. OK, who have access to read those files then? Authenticated Users, which means whoever that has an account in your domain can do this. Conclusion: do not change password with GPP unless you do it and remove the policy directly after the policy has successfully been applied. In this blog post series from Microsoft PFE’s, you find a great solution to handle and store local admin passwords in a secure, yet manageble way. 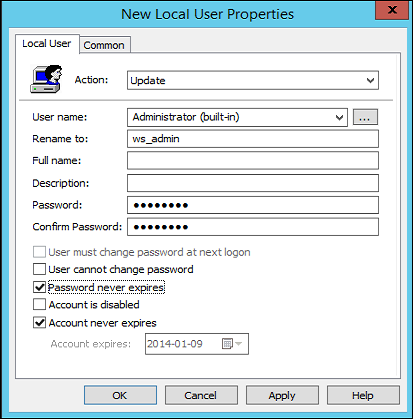 This entry was posted in Active Directory, Group Policy and tagged GPP, Group Policy Preferences, passwords, vulnarebility on January 9, 2014 by Johan Dahlbom. Just like the other one it’s based on the GroupPolicy PowerShell-Module which works from 2008R2 and up. If you want to export all printer information to a csv file, use below row. The script finds all shared printers deployed with GPO (both deployed printers GPP.) in your domain. GPOType = "Group Policy Preferences"
GPOType = "GPO Deployed Printer - User"
GPOType = "GPO Deployed Printer - Computer"
This was done very quick, will probably do some things a bit nicer later on. If you find any direct issues or bugs, let me know! This entry was posted in Active Directory, Group Policy, PowerShell and tagged Gpo, powershell, Printers on January 7, 2014 by Johan Dahlbom. Group Policy Preferences are mostly great and frequently used to solve different kind of policy related problems in an it Environment. There are a few PowerShell cmdlet for GPO’s (28 last time I checked) but only three of them are related to Group Policy Preferences. A customer of mine wanted to inventory their GPP Drive maps, and get information about what GPO, drive letter, drivepath, security Filtering and so on. The script is using the GroupPolicy POSH-module which has been around since 2008R2, so this works even there. 1. Gives you all Drive Map GPO’s plain and formats the output as a table. Note: The DriveAction object is not translated to a more friendly name at this time so U, stands for Update, D, for delete and so on. That is also applies on the DrivePersistent output (“Reconnect”). Update: This is now updated so it gives you a bit of nicer output! 2. Searches for drive maps in a specific GPO. 3. Exports the output to a csv. The script finds the GPP Drive Maps in your domain. DriveLetter = $drivemap.Properties.Letter + ":"
The script can of course be extended with a lot more information, and make the output easier to read, but that’s a later project. This entry was posted in Active Directory, Group Policy, PowerShell and tagged Drive Maps, Drives.xml, GPP, group policy, Group Policy Preferences, GroupPolicy, powershell, XML on December 31, 2013 by Johan Dahlbom. Now you don’t have to look after this information anywhere else than your AD, can be very handy in many situations. To implement this you have to put the script below as a logon script for all users and delegate control so that Domain Users or any user group of your choice have write permissions to the description attribute of computer objects. This is easiest done with the delegate control wizard that you find by right clicking to any OU. Getcomputersystem = strModel & " (" & Getcomputersystem & ")"
This entry was posted in Active Directory, Group Policy, Windows Client on October 2, 2012 by Johan Dahlbom.